A Fender Custom Shop instrument is extraordinary. You know it when you play one—it’s definitely more than the sum of its parts. It’s filled with intangible, electrifying elements that add a new dimension to your playing experience. It’s as if the instrument itself is imbued with history, alive with the spirit of the place where it was built and the devotion of those who crafted it. 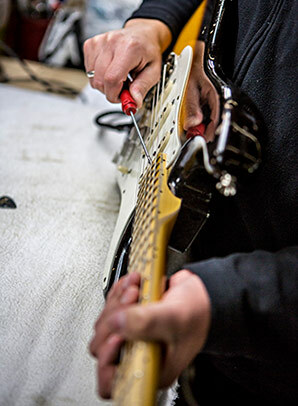 The Custom Shop is home to Fender’s most skilled and talented builders. It’s a bustling, noisy and creatively volcanic place that re-earns its nickname—the Dream Factory—every day. Custom Shop builders are completely dedicated to their art—part craftsman, part artist, part music fan and, more often than not, part mad scientist. They’re the best at what they do, and they pour all of their passion, hard-earned knowledge and skill into every instrument they build. It’s no ordinary place, and the creations that come from it are no ordinary instruments. Welcome to the Fender Custom Shop. For players who wish to create a completely custom instrument—anything from a humbucking pickup-equipped banjo to a custom-engraved aluminum-bodied Strat®—we offer Masterbuilt, a singular experience working one-on-one with one of our Master Builders. Custom-Built is for those prefer to start with one of our time-honored models and personalize the specifications to meet your specific needs. Use this guide to design your very own Masterbuilt or Custom-Built Fender guitar and make your dreams come true. In every art form, there are those who have mastered their craft so thoroughly, through years of training and experience, their work routinely commands extra acclaim and admiration, not to mention outright awe. 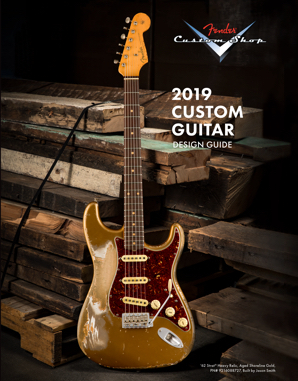 These astonishing artisans are the Master Builders of the Fender Custom Shop; a select group of the most talented builders recognized around the world for their matchless skill, limitless imagination and utter devotion to their art. Crafting a guitar with a Custom Shop Master Builder is the ultimate artistic partnership—simply put, no idea is too crazy and no job too large or too small. They’ll walk you through everything—body design, neck shape, tonewoods, pickups, hardware and more—to give you the look, feel and sound that you’re searching for. From start to finish the Master Builder will personally ensure that each guitar is built with the highest possible quality and to your exact specifications. Additionally, it’s about more than just specifications, it’s about making the instrument of your dreams a concrete reality.